Research has shown that 50% of us believe that we are lucky, and 14% think we are unlucky. The remaining 36% are neutral. 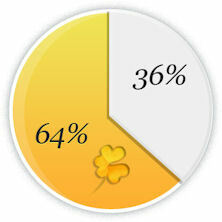 That means that 64% of us (almost two out of three people) believe that luck somehow determines how our lives act out. But what if there was a way to scientifically increase how lucky you actually are? That's precisely what Dr Richard Wiseman set out to do, over a decade ago. He started a ten-year scientific study, designed to figure out precisely what luck is, and how it affects us. Working with over 400 individuals, he aimed to figure out precisely why certain people are "lucky" and others aren't. Jessica is a typical example of a lucky person, and was covered in Wiseman's study. Patricia is the opposite. She's an example of an unlucky person, also covered in the study. At 27-years old, she worked as a cabin crew member - and had a reputation for being a "jinx." Her flights always had problems: drunkards, lightning strikes, emergency landings. She was also unlucky in love, and always seemed to be in the wrong place at the wrong time. Patricia never wished anyone good luck, for fear of transferring her ill fortune. So what separates the lucky people, such as Jessica - from the unlucky people, like Patricia? Is it all just coincidence? Or fate? Or could there be a much more scientific explanation? As the 10-year study progressed, Dr Richard Wiseman started to realize that the "lucky people" were doing a series of specific things differently to the unlucky people. The lucky people were using a handful of simple techniques (even though they didn't realize it), which were making a huge difference to the luck they were experiencing. Not only that, but when volunteers such as "bad luck Patricia" decided to try using these techniques, their own fortunes turned around dramatically. Dr Richard Wiseman's findings ROCKED the scientific world. As the study concluded, he went on to carve out the precise methods that "lucky people" were using - which anybody could later use to consistently improve their luck. Wiseman even created a temporary "Luck School," in which students spent a whole month practicing the simple techniques. At the end of the process, over 80% of students reported a dramatic increase in their luck during that time - including bad luck Patricia, who reported that after a couple of weeks, her bad luck had "completely vanished" and that she was a "completely different person." This inspiring study has important implications. It means that by using these simple techniques, individuals - just like you and me - can make the decision to control and improve just how incredibly lucky you are. Doesn't that sound like something you'd be interested in? The findings of Dr Richard Wiseman have since been enhanced by the work of scientists, psychologists and neural experts, such as Todd Kashdan, Dr Win Wenger, Sonja Lyumborisky, and Michael Losier. But one of Wiseman's earlier experiments still stands out as an early breakthrough. Wiseman asked groups of individuals to classify themselves as either "lucky" or "unlucky." He then gave each of the individuals a newspaper, and asked them to count the photographs inside. On average, the unlucky people took around two minutes to count the photographs. But the lucky people took just seconds. Why? On the second page of the newspaper, a large message in a type-face over two inches high, stated: "Stop Counting: There Are 43 Photographs In This Newspaper." So, why were the "lucky" people seeing this message - and "unlucky" people not? Lucky people simply use a handful of different methods to look at the world, which scientifically make them more open to opportunity. More exciting, anyone can adopt these techniques, quickly and easily. So, how can you change your attitude - and become one of those scientifically luckier individuals? How can you become the person that spots the message, and stops counting the photographs? The answer all lies in your mind.